I sold my first pulp suspense story in 1945 to Mike Tilden the editor of Detective Tales. 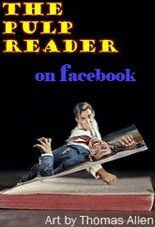 Once I broke into the pulps, I had a steady stream of short stories and novelettes published by Popular Publications both suspense stories and Westerns and other publishers such as "Pursuit, Malcolms, Manhunt, Alfred Hitchcock, Publishers paid one cent a word for stories in those days. One could make a good living if he or she could turn out a lot of stories. I wrote all of my stories first draft (as did other pulp writers I knew). I could write a 5,000 word story in a day. (One day I wrote a 9,000 word novelette in a working day. (no time for much revising.) We used mechanical typewriters. The Royal portable was the choice of many of the writers I knew. I grew up in Texas so knew a lot about rattle snakes so I used that for a basis of my first story, STRICTLY POISON. Once I was making a living from full time writing I visited many of the big cities, San Francisco, New Orleans and New York. My favorite was Manhattan where I had leased a small apartment a block from Central Park west. New York was the center of the publishing business so I became friends with many of the best known editors of the pulps. 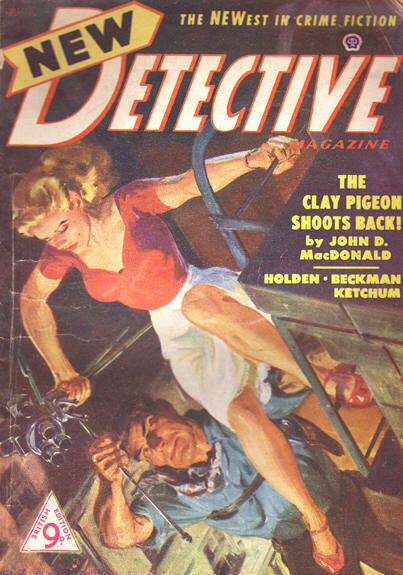 I also got to know the top writers in the field, such as Day Keene (he was on the cover of almost every pulp story magazine) Talmage Powell, Gil Brewer, Harry Whittington, and others. In the 1920's,30s, and 40s a large segment of the population got their entertainment from radio and magazine stories. Every month the magazine stands were filled with fiction stories-- suspense, murder, action, love and science fiction stories and others. The pulp stories (so called because of the cheap pulp paper on which they were published) sold for ten or fifteen cents and had ten or fifteen stories. 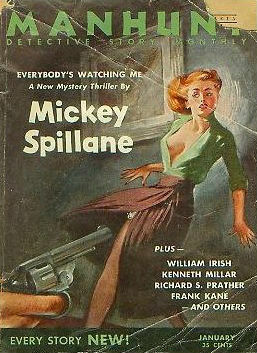 I started reading the pulps when I was ten years old. I grew up in the Great Depression. We had enough to eat but not any left over for music lessons. I taught myself to play clarinet and saxophone listening to phonograph records. When I left home I had $30 in my pocket, a used portable typewriter and some musical instruments from a pawn shop. I'd always liked the seashore so I took a bus to Corpus Christi, Texas. The next day I had a part time day job and a week-end job playing music. Those were the days of the big band era: Benny Goodman, Count Basie, Artie Shaw, Duke Ellington, Pete Fountain, Fatha Hines, Satchmo Armstrong. I later wrote a book on the history of jazz, Cool. Hot and Blue. I have a copy that was autographed by all of the above. 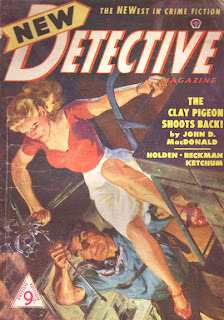 One of the first pulps Beckman appeared in. My writing and music gave me an exciting life and the freedom to travel. I married a beautiful and talented young lady, Patti Kennelly who also had talent as a writer. We collaborated on 26 love stories for Silhouette and Harlequin that sold world wide over two million copies. I'm now 91 looking back over a creative and exciting life. Patti has encouraged me to make a collection of my short stories going back to my first pulp sale in 1945. The collection will be published soon. This excerpt is from a story entitled, “Eddie Builds His Mouse Trap,” from my anthology of short stories that I wrote beginning in 1945. The style of some of the stories in the collection is crisp, biting, and and punchy. Short sentences. Quick observations. Brief descriptions. Some are more in the Alfred Hitchcock style, with longer sentences and psychological twists and turns. It was ironic. All the beautiful dolls Eddie Price had on his string, and a plain little mouse like Ginny Potucek finally hashes him up. “Oh?” Eddie said. Not that he was really surprised, having just tossed their last loaf out in the alley. 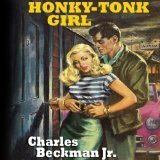 Boeckman and is now available at amazon.com. He stood in front of the dresser mirror, whistling, buttoning up a clean white shirt. It was easy to see why the dames fell all over Eddie Price. He was six feet of man, adequately spread out around the shoulders and chest. He had lazy, grey eyes that would drift over a girl, caressing her, sending shivers up her spine, and a shy, little-boy grin that twisted her heart. After that, she’d be a fit subject for Freud if she didn’t run her fingers through his thick black hair and whisper in his ear. But he wasn’t thinking about dames at the moment. His fingers were all thumbs, knotting his tie, and there was a sick pit of nausea in his stomach. In a few min­utes he was going to kill his bride of two months, Ginny, in a very messy way. He wasn’t too enthusiastic about it. The Trial of the Octopus is now up for pre-order, with a scheduled release of Oct 1st 2012. This is on three DVDs with 14 out of 15 episodes, missing episode 9. Go to the order page here. 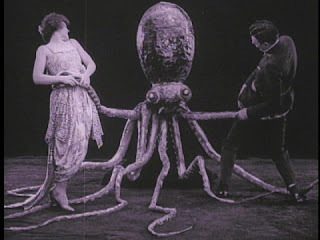 Although we may never see the complete serial of THE MYSTERIES OF MYRA there are other serials that may be just as amazing from the silent movie era. 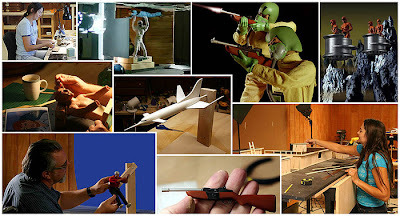 Serials where it is obvious that a lot of money, time and creativity went into the productions. One that will hopefully be available in Spring 2011 is THE TRAIL OF THE OCTOPUS. This is another revelation from the age of the silents; where an amazing globe-trotting adventure comes to life as we meet great detectives, evil cults and mysterious strangers, spanning from a lost city in Egypt to the streets of San Francisco. Dr. Reid Stanhope, a noted scientist, and Raoul Bornay, a Frenchman of questionable standing, set out upon an expedition to explore the mysteries of ancient Egypt. 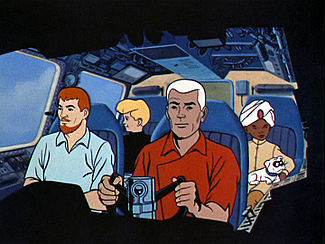 With their caravan of natives and camels, they pierce the very heart of the great Sahara Desert in their search for the Temple of Death and the sacred Talisman of Set, both considered mythological by everyone except Dr. Stanhope. After weeks of searching they discover a sarcophagus upon which hieroglyphics read: “He that toucheth or taketh away the Sacred Talisman of Set will bathe his hands in human blood.” Reaching inside the sarcophagus, Stanhope takes out the Sacred Talisman which is also known as the Devil's Trademark – the cloven hoof of Satan. From the moment the Talisman is released, murder and destruction run rampant. 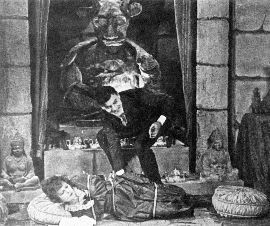 Stanhope is forced to kill Bornay when attacked by him and Bornay's final words are “Don't think you killed a friend – they sent me to get you and the Talisman.” Who “they” are provides the foundation for the story of the rest of the serial, which takes place after Stanhope returned to civilization. 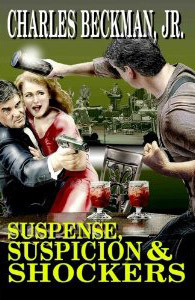 When Stanhope receives a telephone call from the mysterious masked Monsieur X, who tells him that his friend, Professor Hubbard, one of the scientists, is dead, Ruth runs across the street to call on Carter Holmes, the criminologist, taking the dagger with her.Stanhope's scream in the distance begins a chain of events that leads to the kidnapping of Ruth by a clan of Devil Worshippers headed by a sorceress named Madame Zora, and a three-way battle between Holmes, the Devil-cult, and an Asian mastermind known as the Octopus to possess the Talisman by collecting the remaining daggers and placing them together in a cliffside vault that will reveal its secret. 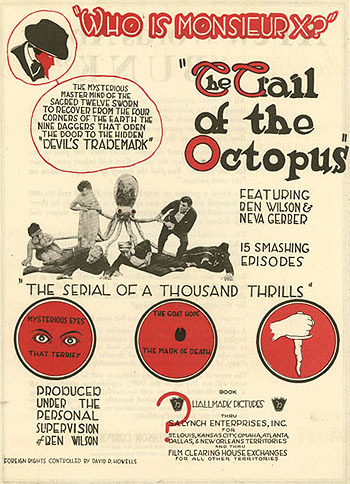 An extremely atmospheric serial, heavily influenced by aspects of THE MYSTERIES OF MYRA (the Devil-cult with its crystal ball, and characters who disappear into astral form), and anticipating DRUMS OF FU MANCHU in its noir-ish look, THE TRAIL OF THE OCTOPUS changes location and emphasis many times but remains generally in early pulp/detective/horror mode throughout, with more than the occasional element of the paranormal thrown in to kick the mystery up a notch. This serial is being restored by the Serial Squadron and even some missing scenes are being re-filmed with contemporary actors in order to have the story be as complete as possible. TRAIL OF THE OCTOPUS is $40 for 2 double-sided DVDs. This is a very fair and reasonable price for a micro-production which is putting out a small run, but professionally restored and extremely rare serial. You won't find this serial anywhere else because it does not exists anywhere else. This DVD set is being digitally remastered from a 35mm print from the Library of Congress. Along with the visual restoration the Squadron's Eric Stedman has mixed a new sound track including music that is scene relevant along with sound effects for important points of nuance. This in my opinion really adds a layer of watchability and entertainment value to the whole project. You can see and hear the results in a sample posted at the bottom of this entry.